Look who flew into our humpy one night this week. 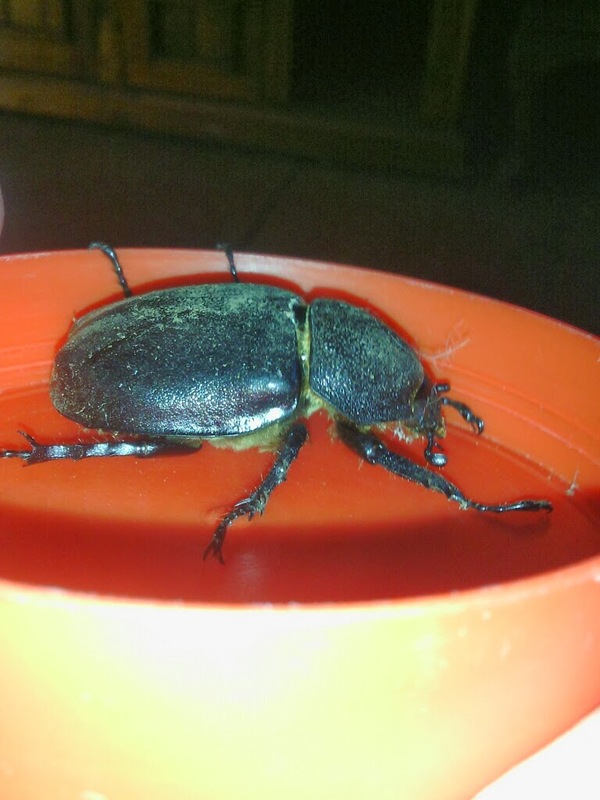 You can’t tell from the photo, but this is one ENORMOUS beetle. The elephant beetle, or Xylotrupes ulysses grows to an average size of 60 mm long. Our visitor was a female as she didn’t have the distinctive ‘horns’ on the front. She buzzed in like a small aircraft and proceeded to circle the light in ever diminishing spirals, when she landed we caught her for a closer look and a photo session (bug paparazzi). It is fairly rare to be able to call an insect ‘he’ or ‘she’ but the elephant beetle is sexually dimorphic (male and female look different) so it makes using the right pronoun that much easier. 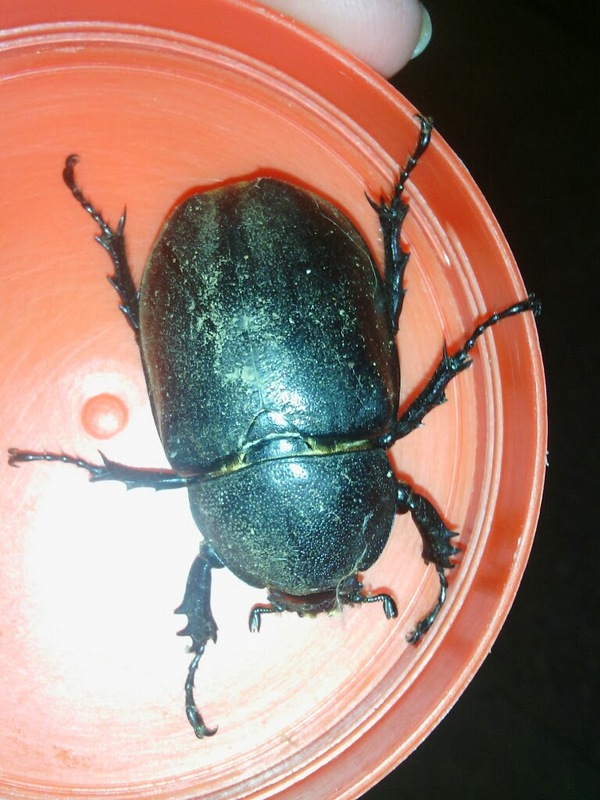 Elephant beetles eat decaying organic matter so they are useful in the compost heap. The females lay about 50 eggs at a time although lots of the larval stage (white curl grubs) end up as food for foraging animals. They have a particular affinity with scrub turkey nests (big compost heaps) so I am now wondering if we have one nearby. Adult beetles feed on new leaf shoots and have been classified as a native pest in some areas because of their habit of gathering together on specific trees (apparently this is the beetle version of a night club; where they go to find mates) resulting in damage to the tree..
She is a most impressive beetle. 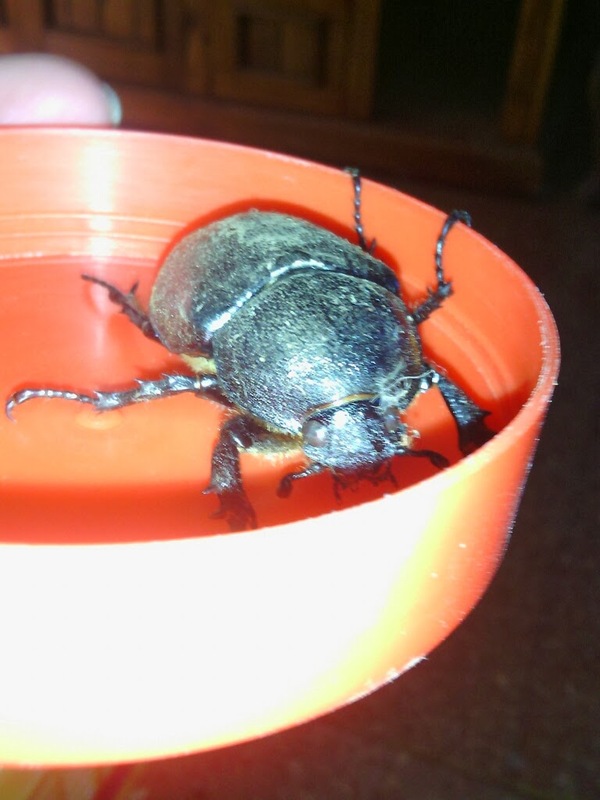 Personally, I don’t see these beetles as a pest, but as just another member of my ecosystem. I plan to leave some piles of organic matter around for them to lay in and maybe harvest some grubs for the chooks at a later stage. Have you seen these beetles where you live?